Welcome to Flutediva.com! This website is for everyone. 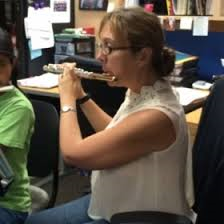 Teachers can find some great flute resources and students can get some great flute playing tips. Feel free to contact me anytime. I strongly feel that every student is individual. There is not one method to teach all students, but each student will need a separate and distinct method of teaching. I believe in limitless expectations for my students. Want to know more about me? Click on my Bio and Resume! This site is also a resource for my private students. If you are interested in taking lessons (I give both live and internet lessons), please send in a form through my contact page.